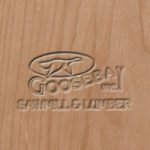 Cherry - Goosebay Sawmill and Lumber, Inc. Figured cherry, or curly cherry, has a patterning similar to that found in curly or flame birch. It is a wide, softly swirling curl that catches the light in wide gleaming swaths across the wood. It is much more open and less tight than the figuring in curly (tiger, fiddleback) maple. We usually have 4/4 curly cherry in stock.